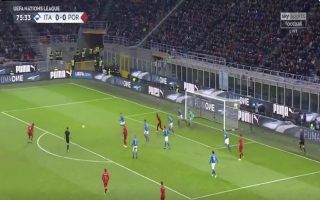 Italy drew 0-0 with Portugal in the UEFA Nations League on Saturday, with Gianluigi Donnarumma taking the plaudits for his display in goal. The AC Milan goalkeeper had to be at his best to deny William Carvalho the winning goal on the night, as he fired in a powerful shot from the edge of the box which the 19-year-old somehow pushed past the post and out for a corner. Italy dominated proceedings and monopolised the ball in midfield, leaving Donnarumma with little to do until this incident 14 minutes from time, which made his athleticism and lightning fast reactions all the more remarkable and helped Roberto Mancini’s men hold on for a credible point against the European champions. Check out the teenage shot-stopper’s outstanding save below via Twitter, which serves as the perfect example of his class and composure at the highest level. SAVE! ?? Italy 0-0 Portugal ?? Great save by Donnarumma from Carvalho’s low strike.